Welcome to A10 Talk’s Preseason Top 25 Player Countdown for the 2018-19 season. Each day, we’ll be publishing a new article counting down our best 25 players for the coming season, as voted on by our staff of writers. Today, we feature #1 Kellan Grady of Davidson. We’ve reached the end of our top 25 player countdown this preseason, which means two things. For one, the season is right around the corner, and finally we can all get back to watching way too much basketball this winter. But it also means that we have one player remaining: Kellan Grady of Davidson tops our list as the highest rated preseason player in the Atlantic 10. 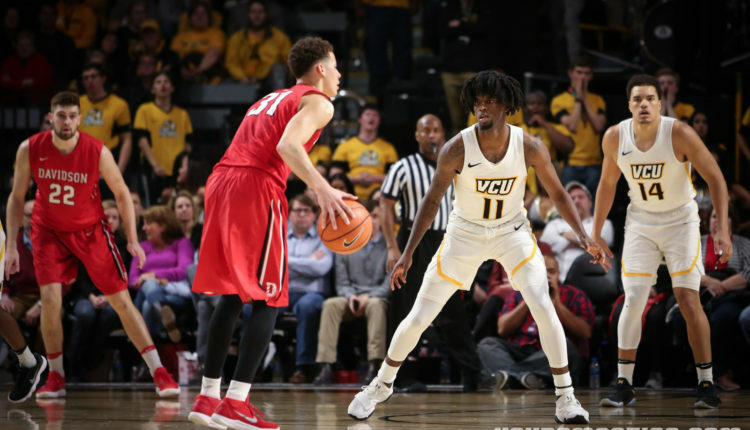 Kellan Grady has popped up as a candidate to be drafted in the first round of next year’s NBA Draft, as he’s expected to take an enormous step up during his sophomore campaign. Last season saw steady improvements from Grady as the season progressed; his college debut featured 23 points on 7/10 shooting from deep, an impressive “Hello World” for the Wildcat. Though, the freshman rust was certainly intact for Grady in the early-going; he’d score a combined 3 points in road games against Appalachian St. and Virginia as the Wildcats struggled to gain traction in November. However, as Kellan Grady got better, so did Davidson. Look at a 39 point performance on the road in triple overtime against St. Bonaventure where Grady absolutely took over for the ‘Cats. Though Davidson didn’t pull that one out, it was clear that Davidson could hang with anyone in the league when Kellan Grady was firing on all cylinders. The conference tournament featured a 23 point night against the Bonnies, followed by 17 points and the game-winning floater for Kellan Grady over URI to send the Wildcats dancing. Make no mistake, Peyton Aldridge’s monster senior season was an enormous reason why Davidson turned things around in the new year and marched all the way to the NCAA Tournament. But Kellan Grady’s role became more and more pivotal as the season progressed, and now, he’s ready to take the reins as the Wildcats’ best player in just his second year of collegiate basketball. Grady has a chance to lead the Wildcats back to the NCAA Tournament, as he has some key weapons at his side to get the job done. Grady had the 13th best turnover rate in the country last year, so he knows how to take care of the basketball and run the Wildcats’ offense. Look for him to continue being a sound distributor, though he’ll be the most dangerous when he attacks off the dribble or drains threes. Grady actually shot 64.1% from 2 point range in conference play last season, which is incredible for a guard. He’s arguably one of the best in the country at finishing around the bucket and can certainly fight through contact as well. Should he improve his efficiency from three slightly this year, he could be that much more deadly as a sophomore. Grady has the tall task of filling the void left by Peyton Aldridge, as the senior did just about everything right for the Wildcats in 2017-18. Look for Grady to be the focal point of the offense, taking shots with the game on the line, having the green light to shoot from just about anywhere, and beating guards off the dribble. It’s undeniable that Grady will be the team’s best player, but getting back to the NCAA Tournament will take getting the entire team involved. Freshmen like Luka Brajkovic could be sneaky weapons for the Wildcats who will definitely be a guard-oriented team. Expectations are sky-high for Grady as he enters his sophomore season, and Davidson will go as far as the Massachusetts native will take it.